We know this polymath as a writer, publisher, printer, merchant, scientist, moral philosopher, international diplomat, and inventor. Musically he invented the glass harmonica, but he also invented the Franklin stove and started the first lending library and fire brigade in Philadelphia. He did experiments in electricity and developed the lightning rod. He was one of the five drafters of the American Declaration of Independence, along with John Adams and primary drafter Thomas Jefferson. Franklin was 70. At 81 he served as the oldest delegate at the Constitutional Convention. During the Revolutionary War, he served as Minister to France and managed, with his sagacity and salon celebrity, to convince the French King Louis XVI to support the American cause financially and militarily. He dazzled the salon crowd with his notoriety and flirtation, much to John Adam‘s chagrin. When a person appeared before the French king in Versailles, it was always without a hat. Franklin showed up in a coonskin cap. Franklin captivated Paris society. 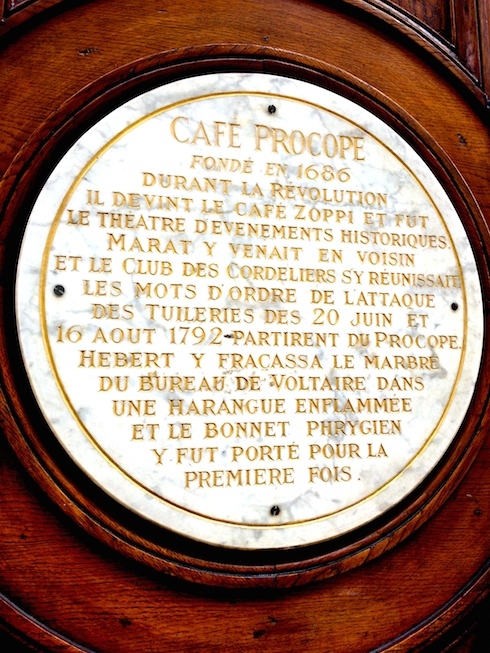 He frequented the first and now oldest coffee house in Paris Café Procope as did other luminaries of the time like Thomas Jefferson, John Paul Jones, Voltaire, and a young Napoleon Bonaparte. Franklin was the most famous private citizen in America and the most celebrated American in Europe. Though he never went past the second grade in school, he was often referred to as “Doctor Franklin” in public. He was awarded an honorary Doctorate by both the University of St. Andrews and Oxford University as well as honorary Masters Degrees at Harvard and Yale. As a moral philosopher, he was a personal mystery. Though he believed that the new Republic could survive only if its citizens were virtuous and he wrote pithy and wise sayings in “Poor Richards’ Almanac” — he did not live by all of them himself. He is usually considered a deist, at least in the early part of his life. Nevertheless, he proposed clergy-led prayer each morning during the Constitutional Convention in June of 1787. He said “God governs the affairs of men” yet he also said, “I have some doubts as to [Jesus’] divinity.” He was a huge fan and supporter of the international evangelist George Whitfield and would go on to publish all his sermons. But he did not subscribe to Whitfield’s theology. Also, Stiles wanted to know specifically what Franklin thought of Jesus: Was Franklin really a Christian or not? Franklin responded that Jesus had taught the best system of morals and religion that “the world ever saw.” But on the troublesome question of the divinity of Jesus, he had along with other deists “some doubts.” It was an issue, he said, that he had never carefully studied and, writing only five weeks before his death, he thought it “needless to busy myself with it now, when I expect soon an opport[unity] of know[ing]the truth with less trouble.” It would be difficult to burn a heretic like that. 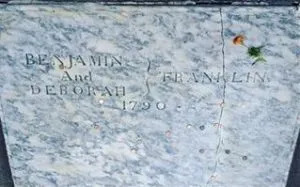 After he died though, his will stipulated that on his gravestone appear only “BENJAMIN And DEBORAH FRANKLIN 1790.” His funeral in Philadelphia attracted the largest crowd of mourners ever known, an estimated 20,000 mourners. Major parts of the Western world changed from the Julian Calendar to the Gregorian Calendar in the mid-1700s. However, when Pope Gregory XIII of the Roman Catholic Church decreed the calendar fix, not everyone embraced the change. In fact, Great Britain at that time was not a fan of the Roman Catholic Church and many in England protested the calendar change. For those born in that gap, they lost 11 days of their lives: following Wednesday, September 2, 1752, came Thursday, September 14. September 3 instantly became September 14 and, as a result, as explained at Project Britain nothing happened between September 3 and 14 1752. In other words, The British Calendar Act of 1751 proclaimed that in Britain (and her American Colonies at that time) Thursday, September 3, 1752, should become Thursday, September 14, 1752. Franklin embraced the change though others in England and America remained a bit upset. Good post old friend. Appreciate your craft. Excellent as usual, Bill. Thank you for the time and effort you put in. Bill, I recommend to your readers part 2 of “The Autobiography of Benjamin Franklin,” in which he defined thirteen virtues: Temperance, Silence, Order, Resolution, Frugality, Industry, Sincerity, Justice, Moderation, Cleanliness, Tranquility, Chastity, and Humility, and a weekly plan to perfect himself in each virtue, one at a time. I read the “Autobiography” as a young teenager, copied the virtues into a small binder, and went to work. I did not have as much success as Franklin claims to have had, but his list of virtues, along with the Scout Law, formed the practical goals of my young life. My list of virtues contain’d at first but twelve; but a Quaker friend having kindly informed me that I was generally thought proud; that my pride show’d itself frequently in conversation; that I was not content with being in the right when discussing any point, but was overbearing, and rather insolent, of which he convinc’d me by mentioning several instances; I determined endeavouring to cure myself, if I could, of this vice or folly among the rest, and I added Humility to my list giving an extensive meaning to the word. Good summary. I am also partial to the lessons of the BSA.